Mt. Everest (Mount Qomolangma) is the highest peak in the world. In this itinerary, you can visit the Base Camp to Mt. Everest. The Base Camp is around 5200m high and only around 20km to the north of Mt. Everest. It is an ideal place to view the Mt. Everest. There you would find Mt. Everest looks like to be in the front of you – in fact, it is right on the another end of a valley. The scenery there is unique and amazing. The area near Mt. Everest is one of the most remote areas in the world. 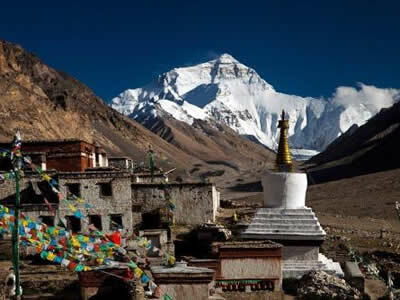 Other places in this itinerary are in the central Tibet with mild and pleasant climate. It makes this area available for tourists year around. Tourists can enjoy the epitome of Tibet with some of the most impressive visions: snow-capped mountains and holy lakes, splendid monasteries and palaces, major cultural center cities, original villages and unsophisticated people. With the better road conditions and nice accommodations, it is now the most popular route for Tibet Tour. 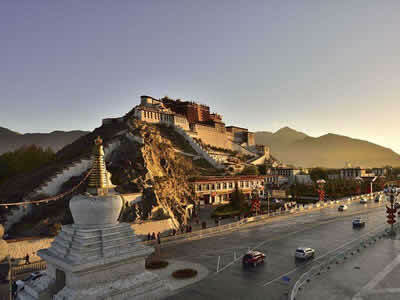 Lhasa, literally meaning “Holy-Land”, the heart and soul of Tibet, has history of more than 1,300 years. It rose to prominence as an important center of administrative power in the 7th century AD, when Songtsen Gampo, a local ruler in the Yarlung Valley, continued the task of unifying Tibet. Songtsen Gampo moved his capital to Lhasa and built a palace on the site that is now occupied by the Potala. The fifth Dalai Lama also made Lhasa his capital. He built his palace, the Potala, on the site of ruins of Songtsen Gampo’s 7th century palace. Lhasa has remained Tibet’s capital since 1642, and most of the city’s historical sights date from this second stage of the city’s development. Shigatse, the second largest city in Tibet, is another political, economic and religious center other than Lhasa. Shigatse has been the seat of the Panchen Lama - the second most important Lama in Tibet, who is traditionally based in Tashilhunpo Monastery. Potala Palace (UNESCO World Heritage), Jokhang Temple (UNESCO World Heritage), Barkhor, Drepung Monastery，Sera Monastery, Tibet Museum. Yamdroktso Lake, Nojin Kangtsang Glacier, Kumbum, Palcho Monastery. * Visit the most famous monasteries and palace in Tibet to know the history, customs and religion there. * Enjoy the fascinating beauty on the Yamdroktso Lake – one of the three holy lakes in Tibet. * Visit the fabled Base Camp to Mt.Everest. Your private guide, car and driver will meet you at Lhasa Railway Station or Lhasa Gongga Airport and take you directly to your hotel in downtown Lhasa. Relax and enjoy the fantastic scenery along the Lhasa River on the way. You are advised to take a good rest, eat simply, and drink some water on the arrival day to acclimatize. The first day of sightseeing in Lhasa starts from Lhasa’s cardinal landmark – Potala Palace, a structure of massive portions. Its towering image already appearing on various occasions, but your first sight of the Potala will still be an awe-inspiring moment. Your guide knows the best spots for taking photos of the Potala. Some 2 km to the east of the Potala is the most revered religious structure in Tibet – Jokhang Temple - the most sacred temple in Tibet, which attracts pilgrims from all parts of Tibet to prostrate themselves in front of the temple. Bustling with worshippers and redolent with mystery, the Jokhang is an unrivalled experience. The views of the Potala Palace from the rooftop of Jokhang Temple is breathtaking. Your guide will definitely take you there for great photos. The quadrangle of streets surrounding the Jokhang is the Barkhor – Lhasa ’s most interesting pilgrimage circuit. This area of the Old Town is both the spiritual heart of Lhasa and the main commercial district for Tibetans. Today you will visit Drepung Monastery, Sera Monastery and Tibet Museum. The Drepung Monastery was established in 1416 by Tsong Khapa (the founder of Gelugpa Sect, the most important sect of Buddhism in Tibet)s disciple Jamyang Qoigyi, who was versed in both Esoteric and Exotoric Buddhism and became the first Kampo (head lama) there. With the support of plutocrats, it developed as the richest monastery of Gelugpa and became the mother temple of Dalai Lamas. In 1546, the third Dalai was welcomed as the first Living Buddha into the monastery. At the invitation of Mongolias king, he went to Qinghai Province to preach. He was dignified with the title the third Dalai Lama the first and second Dalai were entitled, too. It is the very place that the second, third, and the fourth Dalai Lama held the Sitting-in-Bed Ceremony, as well as the residence of the fifth Dalai before his nomination by the government of the Qing Dynasty (1644 - 1911). Supported by the Army of the first Emperor of Qing Dynasty in Beijing, 5th Dala Lama became the king for both monks and common people in whole Tibet and moved to Potala Palace from Drepung Monastery. Sera Monastery lies at the foot of a mountain in the northern outskirts of Lhasa. It was founded in 1419 by Jamchen Choje, one of the eight disciples of Tsong Khapa, the founder of Gelugpa Sect, the most important sect of Buddhism in Tibet, covering an area of 114,964 square metres. The structure is imposing, picturesque, and splendid in green and gold. Sera Monastery, together with Ganden Monastery and Drepung Monastery in Lhasa, are reputed as the Three Great Monasteries of Tibet. It is very famous for The “Buddhism Scriptures Debating” in the Buddhist Collage in the Monastery. Located in the west of Lhasa city, the Tibet Museum covers an area of 23,508 square meters (5.8 acres) including the exhibition area of 10,451 square meters (2.6 acres). The museum is equipped with modern facilities to ensure quality service for visitors and safety and efficient administration of the museum itself. Here exhibits are introduced in Japanese, English, Tibetan, and Chinese, in order to accommodate visitors from all over the world. Today’s drive is around 360 km / 6.5 hrs. Yamdroktso Lake (4441m), one of Tibets three holy lakes, is located 110km outside of Lhasa. The road to it is mostly mountain road, winding and bumpy, even thrilling somewhat. After about 3.5 hours driving, climbing over the snow pass of Kambala (4730m) when you can view some major white peaks in the eastern regions of Himalaya to the south and the young Norjing Gang Sang Spiritual Snow Mountain Range to the west, the dazzling Yamdroktso Lake just lies several hundred meters below the road, and in clear weather is a fabulous shade of deep turquoise. Far in the distance is the huge massif of Mt. Nojin Kangtsang (7191m). Descending from the Lookout, down close to the lake and driving passing the local nomadic and farming villages as far as to the western edge of Yamdrok lake where you have your lunch break at Nagar Tse. After lunch continue your scenic driving to Karo La Pass (5050 metres ) where you have your first high altitude adventure experience of Norjing Gang Sang Glacier Peak. Today’s drive is 400km / 8 hrs. 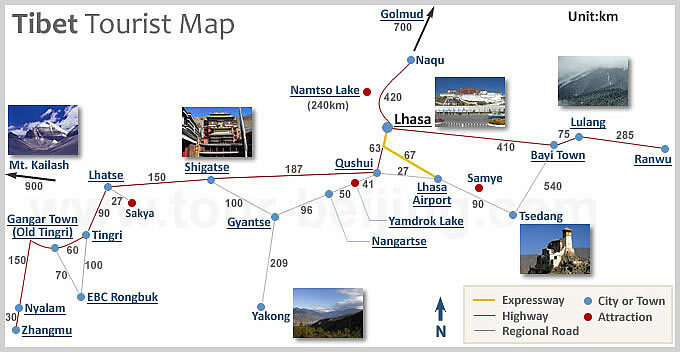 Leaving Shigatse town and continue to drive westward on the friendship highway, pass the 5220 m high Gyatsola Pass to Dingri Shekar. Then continue your overland trip to Rongbuk Monastery. Crossing Gyawu La Pass where you have panoramic view (if weather permits ) of the greatest part of the Himalayas. After arriving at Rombuk in the late afternoon, you can take the excursion to Everest Base Camp (hiking from Rongbuk Monastery (5000m high) up to Mt. Everest Base Camp (5220M High) and back. Of course you can also take the local car to the Base Camp. The Base Camp is still around 7.5km to the Rongbuk Monastery. Overnight at Rongbuk Monastery guest house (dorms without shower, no air-conditioning, no clean quilt and toilet, toilet outside, maybe many people stay in one room. If it is full, maybe you will have to stay in the monk’s bedroom – the condition is kind of poor. ). Because it is very high, we believe it is very hard to fall into asleep this night, maybe you will feel headache and hard breath all night. But stars are very bright. Maybe the Yaks just sleep outside of your window. It is not just the trip of a lifetime, but also the experience of a lifetime. You will have a beautiful morning in the Rongbuk Monastery. Enjoy the sun-rising over Mt. Everest and spend some more time there. Afterwards you will head back to Shigatse. Today’s drive is around 280kms / 5hrs. In the morning, You will visit the second most important temple in Tibet, Tashilhunpo Temple. Afterwards drive back to Lhasa, taking the main-friendship high way by the side of the Yalung Tsangpo River and Enjoy the breathtaking scenery on the way. Overnight in Lhasa. Tashilhunpo Monastery, founded in 1447 by Gendun Drup, the First Dalai Lama, is a historic and culturally important monastery in Shigatse, the second-largest city in Tibet. The monastery is the traditional seat of successive Panchen Lamas, the second highest ranking tulku lineage in the Gelukpa tradition (the most important sect in Buddhism in Tibet). The "Tashi" or Panchen Lama had temporal power over three small districts, though not over the town of Shigatse itself, which was administered by a dzongpon (prefect) appointed from Lhasa. Located on a hill in the center of the city, the full name in Tibetan of the monastery means: "all fortune and happiness gathered here" or "heap of glory".